A German Requiem, to Words of the Holy Scriptures, Op. 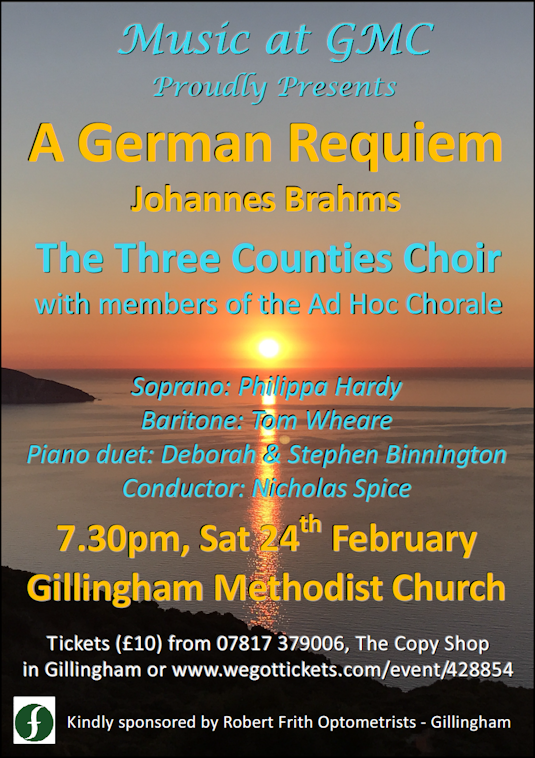 45 (German: Ein deutsches Requiem, nach Worten der heiligen Schrift) by Johannes Brahms, is a large-scale work for chorus, orchestra, a soprano and a baritone soloist, composed between 1865 and 1868. It comprises seven movements, which together last 65 to 80 minutes, making this work Brahms's longest composition. The work is sacred but non-liturgical and, unlike a long tradition of the Latin Requiem, is a Requiem in the German language. Brahms's mother died in February 1865, a loss that caused him much grief and may well have inspired Ein deutsches Requiem. His lingering feelings over Robert Schumann's death in July 1856 may also have been a motivation, though his reticence about such matters makes this uncertain. His original conception was for a work of six movements; according to their eventual places in the final version, these were movements I-IV and VI-VII. By the end of April 1865, Brahms had completed the first, second, and fourth movements. The second movement used some previously abandoned musical material written in 1854, the year of Schumann's mental collapse and attempted suicide, and of Brahms's move to Düsseldorf to assist Clara Schumann and her young children. Brahms prepared an alternative version of the work to be performed as a piano duet with four hands on one piano. This version also incorporates the vocal parts, suggesting that it was intended as a self-contained version probably for at-home use. However, the vocal parts can also be omitted, making the duet version an acceptable substitute accompaniment for choir and soloists in circumstances where a full orchestra is unavailable. This is the version that was performed this evening. The Three Counties Choir was started in 2011, having its origins in a choir formed to sing Messiah for the bicentenary of St George's, Bourton in 2010. The choir has given one concert every year since then, singing works from the classical choral repertoire. Rehearsals are led, organised and accompanied by Tom Wheare, Ros Wheare and Graham Perryman. The Ad Hoc Chorale is a group of experienced singers which meets three times a year to perform a concert in a day. After a Choral Scholarship at Selwyn College, Cambridge, Philippa Hardy continued her singing studies with Janice Thompson whilst teaching music at St Mary's Calne. She now studies with Linda Brown, is Director of Music at Knighton House prep school, and takes occasional private pupils. Tom Wheare sang in the choir of King's College, Cambridge under David Willcocks and the choir of Christ Church Cathedral under Simon Preston. He and his wife Ros started and run the local Three Counties Choir and the occasional gatherings of the Ad Hoc Chorale. Deborah Binnington studied the Piano and Singing at the Royal Academy of Music from where she graduated with several prizes and diplomas. In a varied career, she has worked as a singer, piano accompanist and teacher. Stephen Binnington studied at the Royal College of Music. Organist of St.Gregory's, Marnhull, he is a busy freelance musician, performing, accompanying and composing. Two of his recorder compositions are in the current ABRSM exam syllabus. The husband and wife team have been presenting programmes of piano duets in many parts of the country for over 30 years! Nicholas Spice is the publisher of the London Review of Books. He has conducted the Highbury Chamber Choir, which he founded, for the last thirty years.